ALBUQUERQUE – Visitors to the 2009 New Mexico State Fair will notice several major improvements throughout the grounds, including a completely renovated and remodeled Villa Hispana and newly resurfaced Midway and Food Court areas. 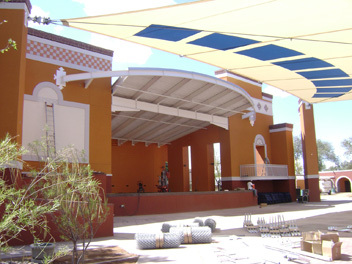 Last year, Expo New Mexico finished the second phase of renovation at Indian Village, which was all new for 2008. The 2009 New Mexico State Fair runs from Friday, September 11 through Sunday, September 27. Villa Hispana will be rededicated on Hispanic Heritage Day, Sunday, September 13 at noon. - new professional outdoor performance stage. The base contract for the Villa Hispana project is with T.A. Cole at approximately $1.5 million. Total cost of the project including all equipment, fixtures, furnishings and other renovations is estimated at $2.3 million. 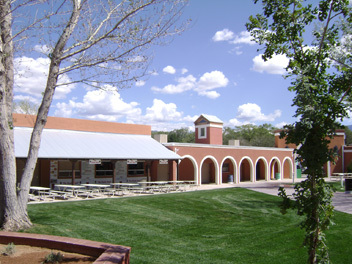 In addition to the Villa Hispana project and the resurfacing of major pedestrian areas of the Fairgrounds, Expo New Mexico has also invested considerably in infrastructure, the repaving of several sidewalks throughout the grounds landscaping and beautification projects, and building reparations (Fine Arts Gallery, Hispanic Arts Building, Manuel Lujan Complex, etc. ).